Edge is a village in the civil parish of Painswick, Gloucestershire, England. The village is situated in an area of the Cotswolds that falls within the Stroud District. For the purposes of local government, Edge is a constituent village of the Painswick civil parish, which also includes the neighbouring villages of Sheepscombe and Slad. The civil parish forms part of the district of Stroud and the county of Gloucestershire. 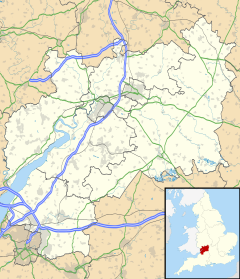 For parliamentary purposes, Edge is within the UK constituency of Stroud and the European constituency of South West England. The village is served by the church of St John the Baptist, which is a part of the diocese of Gloucester. The village hosts a village hall and green, which are used for various functions including the annual Edge village fête. ^ a b c "Election maps". Retrieved 29 March 2017. ^ "St John the Baptist, Edge". Retrieved 29 March 2017. ^ "Village Hall Database". Retrieved 29 March 2017. Wikimedia Commons has media related to Edge. This page was last edited on 2 April 2019, at 06:56 (UTC).